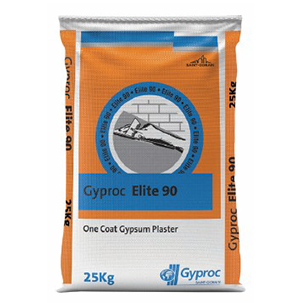 Gyproc Elite-90 is a one coat gypsum plaster for use on almost all backgrounds, e.g. brickwork, block work or concrete. It provides a smooth, inert, high quality surface to internal walls and ceilings and a durable base for application of decorative finishes. It is a lightweight, retarded hemihydrate, premixed gypsum plaster, incorporating expanded perlite aggregate, requiring only the addition of clean water to prepare it for use. Non-combustible (when tested in accordance with BS: 476: part 4:1970), therefore a good form of thermal protection to the building structure. Gypsum Plaster is a gypsum-based plaster which offers one ideal solution for all your decoration needs. It sets quickly and is easy to cast into a shape, making it a very useful material in beautifying walls and ceilings. For thousands of years, gypsum-based plaster (commonly known as POP) has been widely used to coat walls and ceilings. Some of the world’s oldest and developed civilizations (Greek, Roman, and Eqyptian) used POP in their construction. Besides the construction industry, POP building materials can also used for creating models in the pottery industry, ornamental castings, sculpting and even in medicine and dentistry. 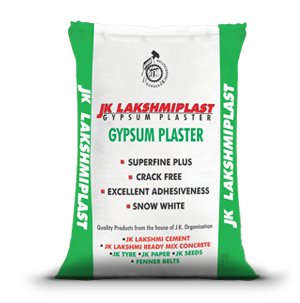 Following are some of the key benefits of JK Lakshmiplast - Gypsum Plaster. It can be easily molded into different shapes. Gypsum in the Gypsum Plaster imparts the extra shine and smoothness. It mixes easily with water and is even easier to spread. It is an excellent fire resistant product and hence ideal as a perfect heat insulating material. It doesn't shrink or develop cracks on setting.